The history of the Civil War is filled with larger-than-life figures who for four years were at the center of the great national drama. Their fight has filled thousands of books, and will, without a doubt, fill thousands more, but for all the great knowns, there are those on the fringe of the story. These figures, however, had just as much an impact on the course of the war, and their stories are just as worthy as telling. One of those figures is Frank Wolford, a Kentuckian who, at the start of the wat, threw his lot in with the United States and became the commander of the 1st Kentucky Cavalry. 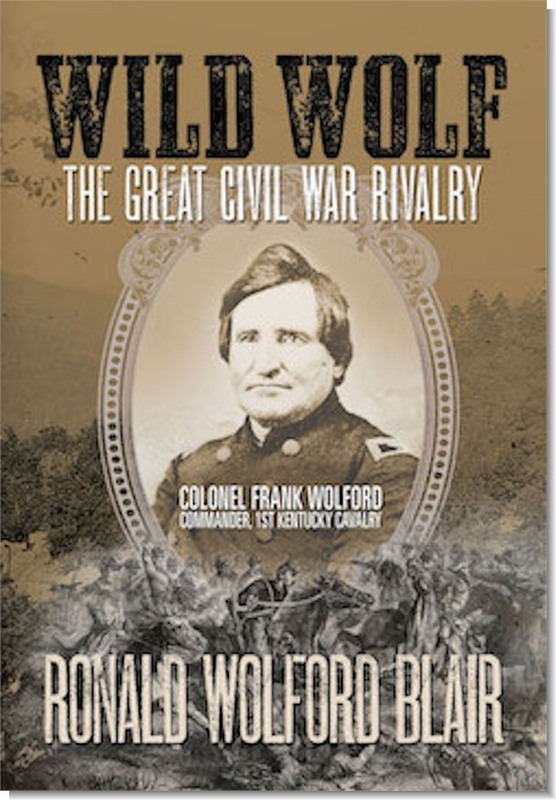 Wolford fought in hundreds of battles, small and large, and his exploits make up the foundation of the newly-published Wild Wolf: The Great Civil War Rivalry, Colonel Frank Wolford by Ronald W. Blair. Blair’s biography offers readers a chance to look at an officer who fought loyally for the Union against one of the Confederacy’s most famous cavaliers in the Western Theater, John Hunt Morgan. Both commanding cavalry, Wolford and Morgan make up the “great rivalry” alluded to in the title. Throughout the first half of the war, Wolford and Morgan clashed against each other in skirmishes that don’t usually find a place in the standard history book. The narrative of those small skirmishes helps to fill in the void and answer the question of what happened between the bigger battles that have countless manuscripts? Wolford’s and Morgan’s rivalry ended with Morgan’s capture in 1863 at the conclusion of his raid through Indiana and Ohio, a campaign usually overlooked because it fell in the shadows of Gettysburg and Vicksburg. About half of the book details Wolford’s fight against Morgan and the other skirmishes Wolford’s Kentuckians find themselves in. The rest of Blair’s book is equally useful in that it details when Wolford went up against another great rival, this one far more surprising, his own president, Abraham Lincoln. As a Kentuckian who aligned his political ideals with the Democratic party, Wolford’s biography reminds the reader that the Federal forces who fought the Civil War were not a monolithic, one-ideal guided force that went to battle all singing “John Brown’s Body.” Rather, Wolford openly argued against Lincoln’s calls for abolishing slavery and the creation of United States Colored Troops. Delivering vehemently anti-Lincoln speeches, Wolford found himself arrested for speaking against his commander-in-chief while in the uniform of a United States Army officer. Repeatedly offered a pardon if he agreed to rescind his remarks, Wolford steadfastly refused. Thus, while his troopers went to fight in later campaigns, Wolford was forced to watch from the sidelines, trading legal barbs with Lincoln in a series of letters. Blair reprints some of these letters back and forth as appendices, and they are well worth reading. Blair continues the narrative of the war to showcase that while Wolford did not support abolition and the arming of black soldiers, as a congressmen he did support the Constitutional rights of these newly freed slaves and struggled to ensure they were given those rights. Wild Wolf has a healthy section of endnotes for those who like to follow the sources, as well as an index and the three appendices mentioned above. It is a recommended book for Civil War historians wanting something a little different than your usual Gettysburg study or biography of the generals in command of armies. This entry was posted in Book Review, Cavalry and tagged 1st Kentucky Cavalry, Abraham Lincoln, Book Review, Frank Wolford, john hunt morgan, Ronald W. Blair, Wild Wolf: The Great Civil War Rivalry. Bookmark the permalink. Great stuff. Frank Wolford is an important figure in Kentucky’s Civil War story. Wolford was just one of many Kentuckians whose loyalty was challenged by Emancipation and the enlistment of African-American soldiers. It was a difficult and strange situation in this state. I am anxious to see how Blair addresses it in terms of Wolford and his decisions.